Trio Ristorante Pizzeria is a rather unassuming galley-style restaurant in the Yonge and Lawrence area. While unassuming can sometimes mean a hidden gem, other times it's just ho-hum--another restaurant resting on their laurels. 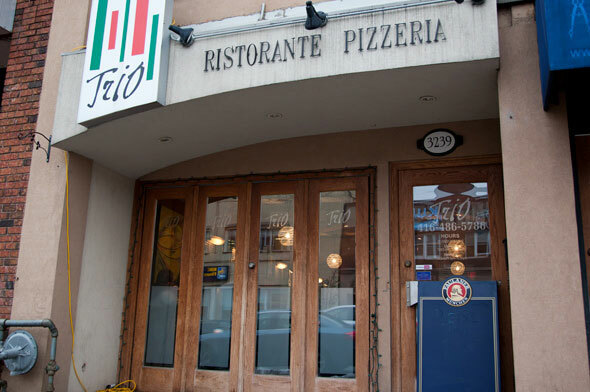 While The National Post once crowned them The Winner of the Toronto's Pizza War (in 2008, mind you) their name is virtually unknown in comparison to the Librettos and Margheritas that dominate our distinguished pizza palates. Owned by Eduardo and Giovanni, two Italian guys who switch between back and front of the house (to keep their creative juices flowing), Trio has been open for 6 years now, taking over from yet another defunct Italian restaurant--Mangia. 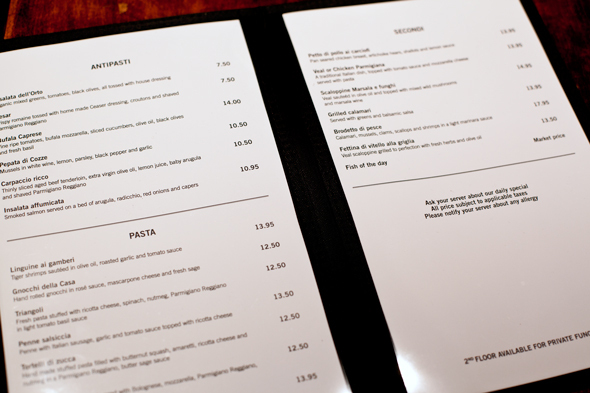 With a menu that covers pizzas, pastas, salads, seafood and steaks, it's a bit of everything for everyone, which is a popular business model in family friendly neighbourhoods: appeal to everyone, and play it safe. While the interior looks like an upscale Italian restaurant, the rocky chairs and uneven tables contradict the implied elegance. With no tablecloths that would formalize the look, the gig is up, although the cloth napkins offer some redemption. The room's focal point goes to the stone-faced wood burning pizza oven, in which the (co) chefs toss one of their 15 signature pizzas (multi-grain crust available) to cook for 2 mins tops at 750-800 degrees Fahrenheit. Red wines dominate the drink menu, almost entirely from Italy, and few whites and a Prosecco are included for good measure. On tap, there are just three beers; Moretti for those inclined to match culinary tastes and countries, Becks, and Paulaner Weissbier, while a decent cocktail list priced $9 and under offers some good alternatives. After an oil-soaked sponge of focaccia greets us, the disappointment continues with the arrival of the Bufala Caprese salad ($14); it's just a big brick of bufala cheese, two (!) basil leaves, a stack of tomatoes, and an artful ring of cucumbers. Three whole black olives complete the circle of neglect. For fourteen bucks, I would expect at least a shot of balsamic or maybe a few more basil leaves, but I would settle for even just a pinch of salt. 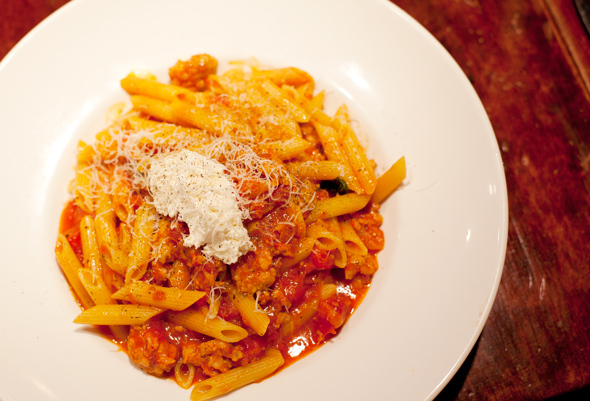 Penne Salsiccia ($13.50) is a complete departure; a bountiful mound of penne combined with a free (uncased) sausage, then topped with a rich dollop of creamy ricotta cheese, and grated parmesan. With the addition of slivers of onions and the odd spinach leaf, the dish is rustic, satisfying and above all, a good value. I ate half the portion and was stuffed, saving a decent amount for lunch the next day. 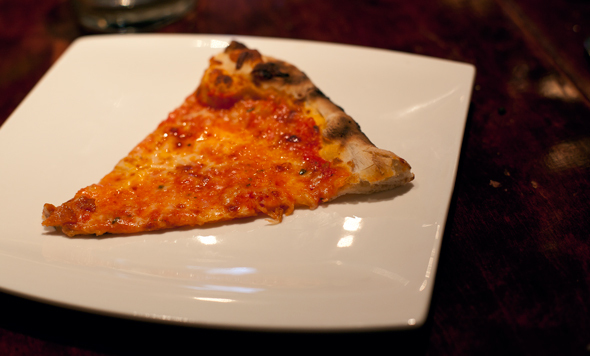 The house speciality pizzas are decent ($13.50 for half pepperoni, half cheese), with a crust that was thicker than the true Napoli style that has become the preferred taste of most pizza aficionados, resulting in a stiffer (less soggy) slice. Trio seeks only to exist, not to impress. 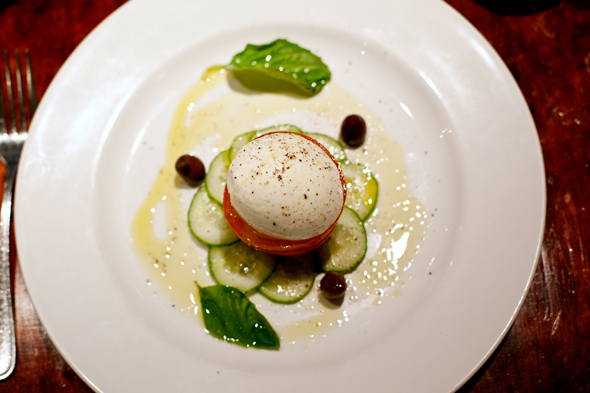 Service is friendly enough; the food is edible and the interior sufficient, but that's not enough to distinguish themselves from the legions of other Italian bistros that compete for mediocrity in this part of town. Trio is wheelchair accessible, and accepts reservations and orders for takeout.